If your water flow has slowed to a dribble then whole house copper repiping might be just what you need. Do you have aging galvanized pipe that needs replacing? If you have no water pressure in the shower, if you can’t run 2 faucets at the same time because the water flow just gets ridiculously low, if your water is orange from rust, if your shower goes hot and then cold then its probably time to consider re-piping your house with all new copper pipe. Galvanized pipe has a tendency over time to become subject to chemical reactions that cause a build up of rust on the inside of the pipe. As plumbers we routinely cut out pieces of older galvanized pipe where, when you hold the length of plumbing up to your eye, you can NOT see out of the other end because of all the rust built up inside. This is generally indicative of the condition of all of the pipe in the house. At this point it makes the most sense to re-pipe the main supply of water into the house and the plumbing. You will get many, many years of improved service from a copper re-pipe. If these symptoms sound familiar to you and your family give us a call at 714-402-7079. 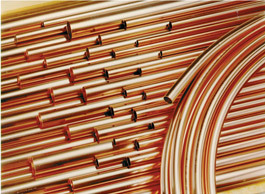 We be happy to help you determine if a copper re-piping is the right solution for your plumbing situation.